We put together this one stop shop for all the parts and videos related to our Project Alltrack. We are inviting fans, customers and car enthusiast to come to our new location. Get a tour, talk cars and meet other enthusiasts! 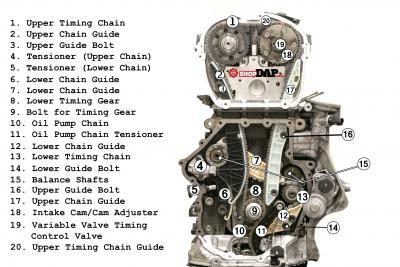 We put together a diagram with the timing components for VW and Audi TSI engine. This is generally to be used for the 3 most common engine codes of the TSI engine, which are CCTA, CBFA and CAEB. Timing Chain and Chain Tensioner Failure Warranty Extensions are finally HERE! Check out our outline of what we have put together in an effort to simply the situation. A complete guide to the timing chain tensioner, and timing chain issues on VW and Audi TSI engines. This in important to understand if you are an owner of any of the vehicles listed in this articles. Looking to do your own service on your B8.5 Audi S4 with the 3.0t (Supercharged) engine? This chart offers the official Audi recommended service interval and oil specs for S4. We also have included our systems we advised servicing that may not have a recommended interval from Audi. Looking to do your own service on your MK5 VW GTI? This chart offers the Volkswagen recommended service interval and oil specs for your MK5 GTI.